I am one whole person, but I have many sides. To me, they all fit together seamlessly, but your understanding of me would undoubtedly be colored by where you met me. If you met me at home, you’d see a person who loves to welcome people in and engage in conversation. We might be sitting on the sofa knitting or on the porch drinking coffee. Or maybe we’d be cooking together in the kitchen, or sitting around the table, sharing a meal. You would understand who I am not just by talking to me, but also by being in the space that over the years I’ve populated with art and books and music and furniture I love. My home would tell my story—a story of babies being welcomed into the world, and how they’ve grown into themselves; a story of love hoped for and lost in divorce; a story of redemption and grace in a new marriage, two lives and families coming together in complex wonderfulness. You would see my writing desk and the chairs around the dining room table, and understand all that I love most in this world. If you met me in church, you would maybe think I am good and have my life all together, but as we talked and worshiped, you would see the brokenness and the ways I’m still journeying, still working to be the person I was created to be. If you met me in a bar on a Saturday night, you might never imagine that I would be heading to church the next day. You would meet the me who loves to have fun—to have a cocktail and a lively political debate with friends, and then to drink and dance and laugh late into the night. You would see the me who loves to let loose. To meet all of me, you would have to follow me to all of the places I live out my life. such a good reminder–we are all so much more than what is glimpsed at any one time or setting. Your blog title immediately captured my attention. I’d love to meet the person behind the name, halfway to normal just like myself. :) I thought you did a great job on the writing prompt above—how different places show different sides of us. May I join you on your porch drinking coffee and you can teach me how to knit?–I’d love to learn. :) God bless you, Kristin. What a wonderfully creative way to approach this fun topic – thank you so much for these insights into who you are. I LOVE your blog and feel like I have tiny bit more info as to what you’re all about from these 5 minutes of unedited reflection. So true. You’d have to meet me in about five different places to understand all of me – though I wish everyone could meet me in Oxford, which is my favorite place, and I think it brings out the best in me. I hope that no matter where you’d meet me, I’d be laughing. And giving out hugs. Because I tend to do those things an awful lot no matter where I am. Of course, the truth is you’re the same person in all those places. It is a less-fortunate truth that we all bring our different sets of expectations to the bar, church, and home. Such a great post. 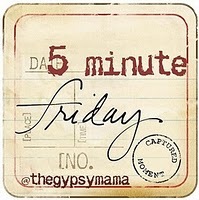 Really like the 5 min idea. Quick n’ dirty. The real question, though, is whether you karaoke? So – here’s a fun thought to add to this …. maybe “being with you” online is a proxy for following you all the places you live out your life? I’ve not been with you in most of these settings but none of what is here is a surprise. And, FWIW, I think you are far more integrated as a person than you sometimes may realize. Or, at least that is my impression and something I admire about you. How true! The many sides of us in different places, revealing who we are. I think Lisa makes a point… a neat benefit of sharing our lives online is getting many different sides of the story. Anna, I’m always glad to meet someone who identifies with the halfway normal life! Thanks for visiting my virtual porch–wish I could teach you to knit from here, but I don’t think that kind of teaching is my forte! Diana, thanks for saying that! You may have already noticed, but my banner illustration (which was drawn for my wedding invitations) represents these different sides of who I am and where I am–home, church, and out in the world. It feels good when someone else *gets* what this “neither here nor there” me is all about. Alise, maybe we all have a few things that are always with us–they’re the “red threads” in our sen of self. Laughing and hugging are good ones, for sure! Ray, you nailed it! I don’t think I’m different in each place, so much as I imagine people’s expectations of me are different. And I’m sure, to some extent, that they are. Those are the stereotypes I’m working to break down here on my blog and in this online community. Lisa, that’s really interesting! I think you’re right about the online me representing a good mix–in part because I have friends I’ve connected with here over one particular shared interest or another, so what I end up sharing here covers it all. When we get together with people in person, we tend to tailor our conversation more (we talk to other parents about parenting, and other Christians about faith, etc.). Hmmm…much to chew on! Jen, “getting many different sides of the story”–I like that! I’ll have to go check out your post (especially because I’d love to meet you! ).